This jewelry box is just the ticket for someone looking for something a bit bigger. In addition to being larger it also features both a mirror on the inside cover and a removable tray inside. 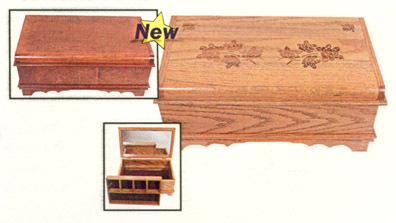 Available in both solid oak, and solid cherry, and with or without a carving in the top, this jewelry box is sure to be an attractive addition to your hardwood bedroom furnishings.